Top 5 Amazing Features In Microsoft Outlook 2013 | GUI Tricks - In Touch With Tomorrow! 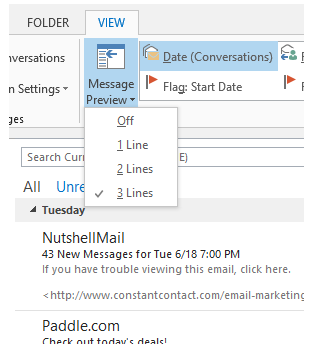 Top 5 Amazing Features In Microsoft Outlook 2013 - GUI Tricks - In Touch With Tomorrow! Outlook 2013, has received much appreciation from the users around the world. Basically, one can say that it’s the same Outlook with enhanced features incorporated to support touch-enabled devices. Let us analyze how the new features, modifications and alterations have diversified the look and working of the new Microsoft Outlook 2013. Here, the five extremely appreciated features are discussed in detail that improve the working of Outlook. Microsoft Outlook has come up with a new look to offer users with an environment which is free from any kind of clutter. At the same time,the overall appearance of the interface is simple and bright, it does not distract users from their work.The main intention behind this design was give the users a new experience to improve the productivity of work. Whenever users get back to their Outlook account after a break, the most important thing is to go through the list of unread messages that came down into their account. In Outlook 2010, a user was only provided the option to view unread emails by selecting the Filter email option, and then choosing Unread. And it would display all the unread emails. 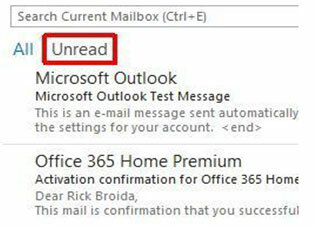 In Outlook 2013, the user just needs to click once on the Unread tab right at the top of their inbox and all the message that are not read will be displayed all together. After viewing the messages, the user can get back to the normal inbox view by clicking on “All” options button just right near it. Conventionally, in all other previous versions of Outlook, a user gets to see the sender's name and subject line for each email in the inbox. In order to view the main content of the message, one has to double click or click it once to see it in the preview pane. 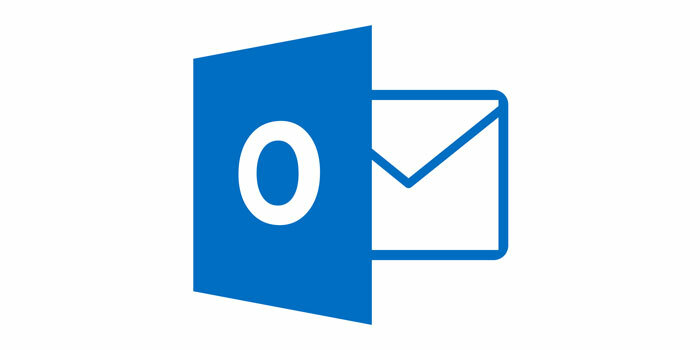 Outlook 2013, supports a convenient and quick approach to access the message body content of email messages from the inbox without necessarily opening them. The user can set a preview of 1 line, 2 lines, and 3 lines of the message content for an email. This is indeed a great method to check out messages without opening them individually, one by one. Also, there is an option to reply back or forward the messages right from the preview without having to moving to the ribbon again and again. On the basis of the user’s screen resolution or size, the text of the message might be too small or large to view it comfortably. In Order to enhance the visibility of messages, Outlook 2013 comes with an inbuilt feature called Zoom slider. Now, users can enjoy the zoom in feature. 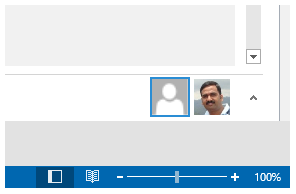 They can drag the zoom slider which is available at the right bottom corner of Outlook in order to zoom the content of their email. However, the other messages remain unaffected while this feature is being used on a mail. 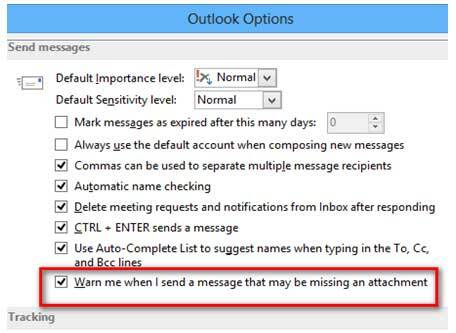 In Outlook 2013, there is a feature which can detect if an attachment was accidentally or unknowingly disregard from the message before sending the email. It will notify the user before sending the message. Thus, giving the users a chance to insert the attachment if they have forgotten to do so. Users can turn off the Attachment Reminder by selecting “Don’t show this message again” in the dialog box or by going to File, Options, Mail and under Send messages, selecting “Warn me when I send a message that may be missing an attachment”. This feature comes as a convenient option for users who usually forget to clip the attachments with their emails. It must be noted that the above-mentioned feature is only available with the English version of Outlook 2013. Users have a choice to embellish Outlook 2013 with a better visual display by selecting from a number of theme backgrounds such as calligraphy, clouds, stars, etc. 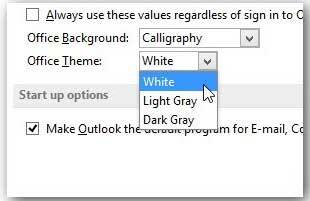 Office 2013 has a default color theme of white. To change the color theme, here’s the process which we'll illustrate how to do it. On the General Tab, select the drop down arrow under the Office theme, choose a color from the list of options. The available options are White, Light Gray, and Dark Gray. This changes the color of the navigation bars. Note: The feature works only with Office 2013 RTM “Release to Manufacturer”. Users cannot change the theme color in the preview. The new model of Outlook has been shaped to gear up the performance level. Certainly, Microsoft has succeeded in trying to position themselves as inventors and transformational. Outlook 2013 looks bright and provides advanced features to make the tasks of user more productive yet simple. However, unlike other Office 2013 programs, in case of Outlook 2013 it will not work if a previous version of Outlook is still running on the background. As author of MS Outlook Tools, Peter has experience more than 20 years in IT industry and he is now working with an expert data recovery firm. He has quality expertise in the Office products, especially in Microsoft Outlook and love to solve users query such as How to perform PST recovery, Outlook tips & tricks, fixes for Outlook errors, etc.